The Omron A.I.R.S. 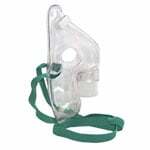 Adult Aerosol Mask is made to be used with the Omron NE-C16V, NE-C18, NE-C25, and NE-U22V Nebulizer systems. Perfect for what I needed it for.